A great 5-day adventure near McLeod Ganj, this short itinerary takes you on an easy trek into the misty foothills of the mighty Dhauladhar mountains. You'll spend two day trekking through the scenic woods of pine and oak with tall mountain peaks darting in and out of view. At picturesque campsites, you'll try your hand at river crossing, participate in team building games and gather around a merry bonfire at night. A great mix of culture, nature and adventure, this McLeod Ganj adventure is perfect for travellers looking to explore Himachal's mountains on a short itinerary. A minimum of two travellers are required to book this McLeod Ganj adventure. You'll visit little-known villages and hills in the Dhauladhar mountains on this McLeod Ganj adventure. En route, you'll find yourself moving through green meadows, thick forests and budding tea plantations. You'll spend the night in alpine tents pitched under the starlit sky and wake up to scenic views of the forests. This off-beat adventure in Himachal Pradesh is perfect for amateur trekkers who want to explore Himachal's mountains on a short itinerary. 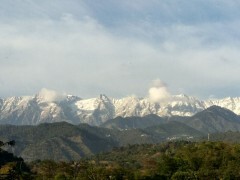 • Experience the mountains of Himachal on a 5-day itinerary. 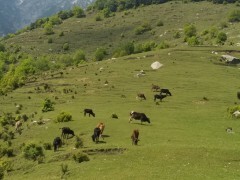 • Trek through scenic hills, forests and villages. • Stay in tents with picturesque views of the mountains. • Visit the culture-rich towns of McLeod Ganj. • Try your hand at river crossing and team-building games. 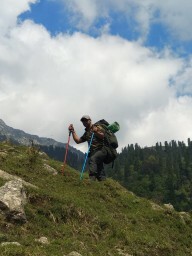 Travellers are required to follow all instructions of the trek leader during the McLeod Ganj Adventure. Consumption of alcohol and drugs is strictly prohibited during the McLeod Ganj Adventure. For cancellations made more than 30 days before departure date of the McLeod Ganj Adventure: 100% refund. For cancellations made between 15-30 days before departure date of the McLeod Ganj Adventure: 50% refund. For cancellations made less than 15 days before departure date of the McLeod Ganj Adventure: no refund. 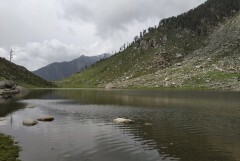 This McLeod Ganj Adventure is an ex-Delhi trip, which means you'll be picked-up from the Majnu ka Tilla bus stand in Delhi by 18:00 hrs on day 1 and dropped-off at 9:00 hrs at the same location on day 5. The tour operator reserves the right to cancel or alter the itinerary of the McLeod Ganj Adventure to maximize the safety of travellers as well as staff. Begin your Himachal trek from the Majnu ka Tilla bus stand in Delhi. You'll board an overnight AC Volvo bus by 18:00 hrs and travel to Dharamsala. Settle in for a long, overnight drive through the plains with towns like Panipat and Kurukshetra and the mountains with tiny hillside villages. Overnight in transit. 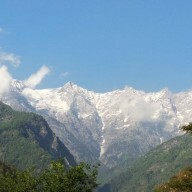 Arrive in Dharamsala by 6:00 hrs and travel to the Bhontu village in private vehicles. Take some time to rest, explore the surroundings and meet your trek leader. Soon, you'll head out from the camp and take the trail to Badhun forest camp. On this short and easy trek, you'll get amazing views of the Kangra Valley at every turn. Reach the campsite and participate in river crossing or a few team building games. The night brings a hot dinner and some joyful time around a crackling bonfire. 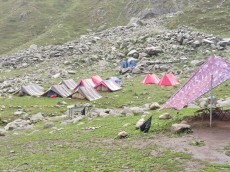 Overnight in tents at Badhun forest camp. Begin descending through scenic forests with tall mountain peaks darting in and out of view amidst the pine and oak woods. On the trail, you'll be greeted by beautiful views of hills in the Dhauladhar range, decked up with snow-capped peaks and lush forests. Reach the Bhontu village camp by afternoon and spend the day at leisure. In the evening, you'll gather around a merry bonfire under the starlit sky. Overnight in tents at Bhontu village camp. You'll board a taxi from Bhontu to McLeod Ganj. Spend the rest of the day exploring local attractions in this quaint town. Visit the Guna Devi temple, the Nichung Monastery or the local Tibetan marketplace. In the evening, you'll board an AC Volvo bus to Delhi. The overnight journey will take you away from the hills and back into the plains. Overnight in transit. Arrive in Delhi by early morning. Your McLeod Ganj Adventure ends here. Personal expenses such as gear or apparel, extra meals or beverages etc. Depart from Majnu Ka Tilla by 18:00 hrs in an AC Volvo bus. No meals are provided during transit, so please do eat a full meal before leaving and carry a light shawl and some dry snacks for the journey. You'll spend the night in the Volvo travelling from Delhi. Overnight in tents at Badhun forest camp. 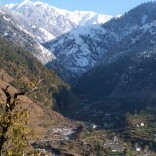 Arrive in McLeod Ganj, travel to Bhontu village in a non-AC taxi and trek to Badhun forest camp. Today's meal plan includes breakfast, lunch and dinner. You'll also be served some evening tea, soup and lemonade through the day. Sleep in comfortable camp tents, equipped with sleeping bags and mats. Overnight in tents at Bhontu village camp. 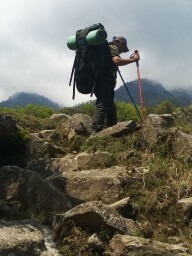 Trek from Badhun forest camp to Bhontu village. Today's meal plan includes breakfast, lunch and dinner. You'll also be served some evening tea, soup and lemonade through the day. Sleep in comfortable camp tents, equipped with sleeping bags and mats. Travel to McLeod Ganj in a non-AC taxi and board an AC Volvo to Delhi. Today's meal plan includes breakfast only. Visit any of the restaurants in McLeod Ganj to have extra meals at your own expense. You'll spend the night in the Volvo travelling from Delhi. Reach Delhi by early morning. Your trip ends here. Majnu ka Tilla bus stand in Delhi is accessible via road and metro. You can board a flight to Delhi's Indira Gandhi International Airport and take the metro to the Vidhan Sabha Metro Station. Local cabs and taxis are also available. 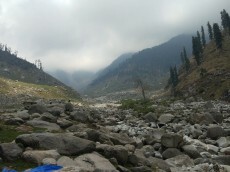 The tour operator will arrange your transport to the start point of this McLeod Ganj Adventure.